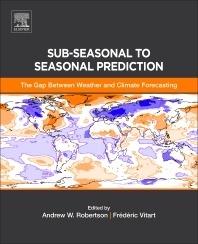 The Gap Between Weather and Climate Forecasting: Sub-seasonal to Seasonal Prediction is an ideal reference for researchers and practitioners across the range of disciplines involved in the science, modeling, forecasting and application of this new frontier in sub-seasonal to seasonal (S2S) prediction. It provides an accessible, yet rigorous, introduction to the scientific principles and sources of predictability through the unique challenges of numerical simulation and forecasting with state-of-science modeling codes and supercomputers. Additional coverage includes the prospects for developing applications to trigger early action decisions to lessen weather catastrophes, minimize costly damage, and optimize operator decisions. The book consists of a set of contributed chapters solicited from experts and leaders in the fields of S2S predictability science, numerical modeling, operational forecasting, and developing application sectors. The introduction and conclusion, written by the co-editors, provides historical perspective, unique synthesis and prospects, and emerging opportunities in this exciting, complex and interdisciplinary field. Weather forecasting: What sets the forecast horizon? Dr Andrew Robertson is a Senior Research Scientist at the International Research Institute for Climate and Society, part of the Earth Institute at Columbia University. He heads the IRI Climate Group and teaches as an adjunct professor at Columbia. Graduating with a PhD in atmospheric dynamics, he has over 30 years of experience in topics ranging from midlatitude meteorology, coupled ocean-atmosphere climate dynamics, sub-seasonal and seasonal forecasting, downscaling, and tailoring of climate information for use in conjunction with sectoral models for climate adaptation and risk management. He has taught in capacity building training courses around the world. Frédéric Vitart is a Senior Research Scientist at the European Centre for Medium-range Weather Forecasts (ECMWF). After graduating with a PhD in atmospheric and oceanic sciences from Princeton University, he joined ECMWF in 1998, where he leads the research on ensemble sub-seasonal forecasts. He has over 20 years of experience in sub-seasonal and seasonal prediction, couple ocean-atmosphere modeling, tropical and mid-latitude meteorology, tropical cyclone prediction. He is the author of over 100 publications in the peer-review literature and has taught in several training courses around the world. Quick and easy order with reasonable pricing. Thank you! It is very useful book with good quality printing. Thanks.